Anju Patwardhan was appointed the group chief innovation officer at Standard Chartered in June 2015 and is responsible for an innovation agenda covering emerging technologies and data science solutions. She will also oversee the SC Studios in San Francisco – to scout for latest technology trends and tap into the dynamic West Coast start-up ecosystem. 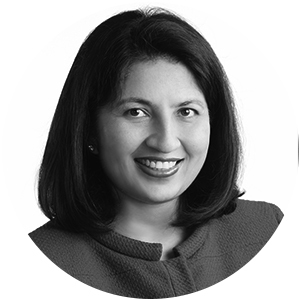 Anju is a member of Standard Chartered’s global technology and operations management group and the global executive leadership team. Since joining Standard Chartered in September 2007, she has held various leadership positions and prior to that worked at Citibank for 18 years. She has been included in SWIFT’s Innotribe 2015 global power women in fintech list of luminaries.